This entry was posted on August 6, 2016 by Tinteán Editorial Team/EMcK, in Drama, entertainment, historical commemoration, Kelly, News, Popular Culture, Redmond Barry, Theatre Notice, What's On... and tagged drama, entertainment, Irish culture, Ned Kelly. Bookmark the permalink. Barry, whose harsh sentencing of Ned’s mother Ellen, to three years goal in 1878 sparked the Kelly Outbreak, is haunted by Ned’s last words to him. ‘I will see you where I go.’ Barry is fiercely determined to see Irish rebels like Ned Kelly punished, but he fears he might be making a martyr out of Ned. Feedback suggests that this event, over 135 years later, might be as emotionally close to the story as you can get. I felt I was right there – felt how those people must have felt! It was brilliant. I highly recommend it! One of the very best stage shows I have seen! 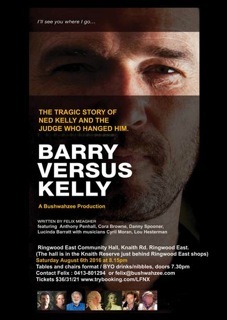 The new musical drama Barry Versus Kelly, was launched at The Old Melbourne Gaol in August 2014. It is produced by Bushwahzee, and features Anthony Penhall as Ned Kelly.